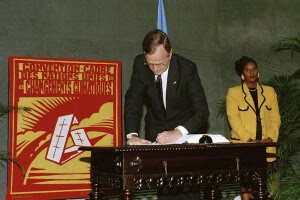 In 1992, President George H. W. Bush negotiated the landmark climate treaty the United Nations Framework Convention on Climate Change. Upon reaching the agreement, Bush EPA Administrator Bill Reilly wrote that a number of EPA programs would play “a key role in enabling the United States to meet the goal of the Climate Change Convention: to cut greenhouse gas emissions using a benchmark of 1990 levels.” For example, EPA’s Green Light Program which Reilly had initiated in 1991 gave birth to the Energy Star program in 1992, a voluntary program that helps businesses and individuals protect the climate through energy efficiency. When the U.S. Senate ratified the Framework Convention in 1992, Senator Mitch McConnell said it was “a fine agreement.” The EPA assumed the duty of preparing the official U.S. Inventory of Greenhouse Gas Emissions to comply with the nation’s commitments under the treaty. More on conservatives and environmental regulation here and here.